The Kingdom Hearts Wiki is a wiki focusing on the Kingdom Hearts video game series, developed by Square Enix in cooperation with Disney. KHWiki attempts to document all things related to Kingdom Hearts, from elements of storyline to gameplay. The site was originally founded on April 1st, 2006 by Riku5464, under the control of the corporation Wikia. The wiki grew uninhibited for many years, until Wikia began imposing features upon its communities. Although the community of the Kingdom Hearts Wiki repeatedly disabled these features, Wikia progressively implemented changes that impacted the quality of the wiki's content. The greatest of these changes, a skin that shifted focus from information to advertisements, became the final straw, leading the wiki to seek private hosting. On February 9th, 2011, the wiki moved to the site khwiki.net, sparking the creation of the Square Enix Independent Wiki Alliance. 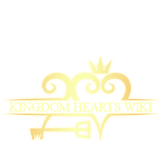 Since this time, the community of the KHWiki has striven to be the most professional and comprehensive Kingdom Hearts resource in the world. On February 28th, 2014, the site domain was changed to khwiki.com. A version of the logo that does not include the characters featured. This page was last edited on 25 March 2019, at 20:14.